All new texturing makes it NOT compatible with saved game. Fixed unique text on minimize buttons traders, town hall. V2.02 - Just a rearranged toolbar. Less cluttered. Final Version? Added Nomad Well as separate download. Icon on my Service toolbar. Nice @kid1293 is this save game compatible ? I have the well built already. SHould be no problems with save-game. I only changed the icons, not the gameplay. Now I need to decide if I want to just leave "tiny" as is in your community toolbar or if I want to see each of them in the vanilla categories which definitely does make them easier to find (since they're not really a matchy matchy set anyways). Either way, thanks kid for going to the trouble of giving us these decisions. @kid1293 , thank you. I added mod to saved game with no problem. I will still keep some of the original separate vanilla toolbar ones too but this set with separate icons is very nice. just a heads up. if you change the order of KID's mods the toolbar icons can change.i noticed you have words for the deco plants.by adjusting the order that too would be an icon.i think i have the colonial set above his others to keep the icons now.the mods work either way,just don't be confused if on a different game they look different.since you change mods each game,the icons will probably switch back and forth. You change mods for each game ? @brads3 I think it is the Colonial mod causing your icon change. I believe the latest 107 Colonial Housing and Colonial Resources mods and Kid's other major mods have the latest word icons rather than the picture icon. @ancientmuse I do change mods for every map, I pick and choose which I want, some stay the same. With my system I had no conflict with 106, one of the reasons I was hesitate to update. I have had only one (not my fault) problem since. I have not had to change my load order except when updating and when adding a new mod, that is a pain when they need to be moved to the lower half of my alphabetical list. I have 290 mods. To me it is fun and part of the strategy to choose the mods for a map, conflict problems is no fun. No overcrowded icon toolbar, no problems finding item I want. Works for me. I have made a small update on Tiny with separate buttons. I will discontinue the original where all icons where under Themed Mods. I have added a school and a hospital. 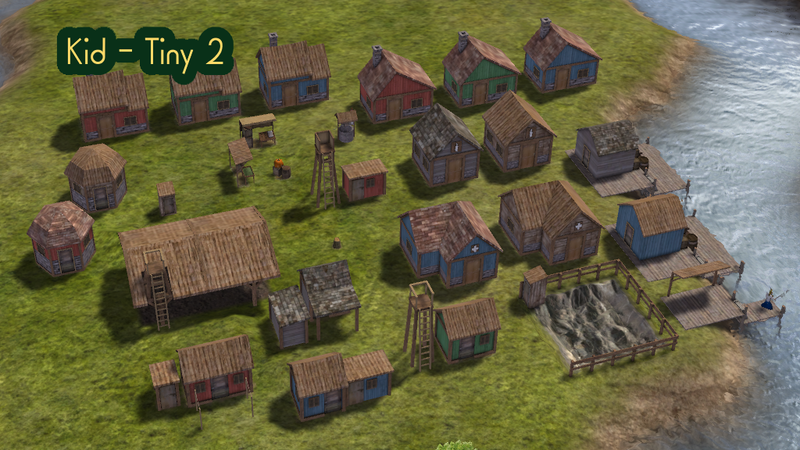 I have added more color choices for town hall, food trader and the new buildings. This comes as a surprise. You've been a busy little beaver ! Looks very nice. Now all you need is the Tailor and Blacksmith, and it will be complete. Thank you!! Oh, a tiny workshop wouldn't be a bad idea. Ok, Ok, I opened the box. I think I want a workshop and it has be tiny. For now you can use my Workplaces. They are small. I will do some other things first but I guess I will come back to this. ask for the next one. I don't mind. I do it when I feel it is right.